April showers bring...May heat waves, apparently. We’ve seen record heat this Spring, and not a little rain. Wouldn’t it be nice to put all that free water to good use on a hot day? 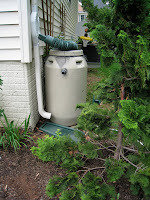 Installing a rain barrel is one way to conserve water and prepare for drought. Rain Barrels capture rain water run-off from roofs. They offer many benefits, not the least of which is saving on your water bill. Rain water is softer than the municipal water that flows through our faucets and is therefor easier on plants. Capturing rain water also prevents run-off and helps preserve the Chesapeake Bay. 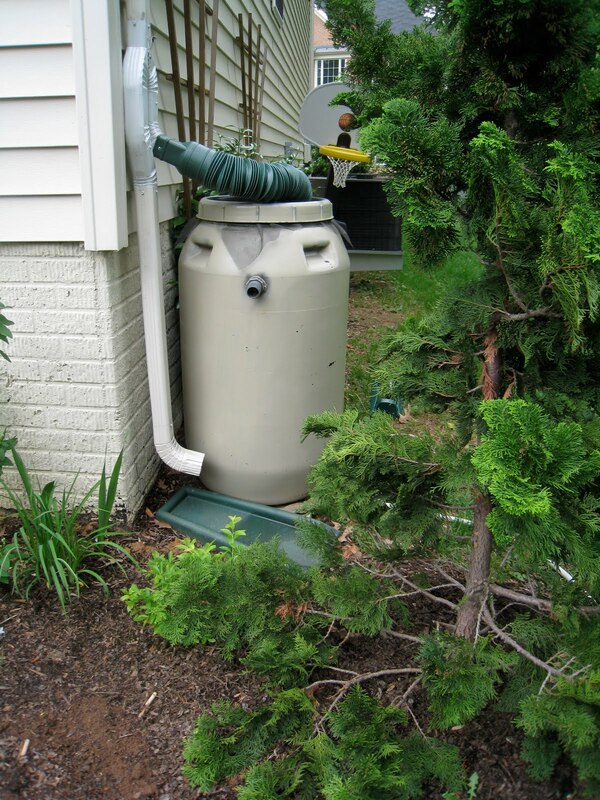 If your lawn is poorly graded, a rain barrel can prevent puddling. Many counties, including Fairfax and Arlington, offer build-your-own rain barrel workshops for a nominal fee. Counties also offer pre-made barrels priced much more reasonable than you’ll find commercially. Last Spring, I built my own rain-barrel at a county workshop. With significant assistance from fellow master gardeners, I drilled a few holes in the barrel, climbed inside to attach the spigot, and sealed the top with mesh that helps prevent insects from laying their eggs in the water. If you love pickles, you’ll enjoy the experience that much more, since the barrels we used were recycled Gerkin vats. To install the rain barrel, we modified our downspout and attached a diverter . The diverter allows us to redirect the water, if the rain barrel fills up. We also dropped a mosquito dunk into the barrel, just to be sure. We use the reserved water for nearby plants, as well as those our hose can’t reach. A rain barrel needn’t be an eye-sore. We spray painted ours to match the house, but I’ve also seen some very beautifully decorated barrels that enhance a green landscape. We love ours so much that we’ll probably get a second one for the opposite side of the house! That's quite a thriving Hinoki cypress in front of the rain barrel. We need to all do our part to conserve water. This is to lessen the load for wastewater treatment plants.